A flat tire on the road is a quick way to cut a short trip if you don't know how to change it. 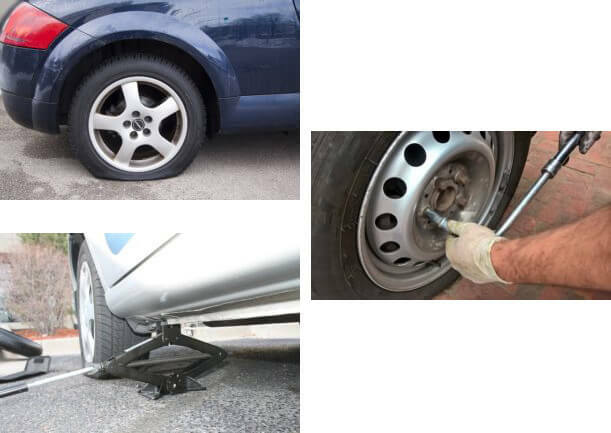 We are here to save you towing costs with our step-by-step instructions on changing your flat tire. The first step of changing your flat is to get it to a safe place off the road. If that is not possible then it is best to wait for a tow truck to tow you off the road. If you do manage to get to a safe location, put on your parking brake, place the wheel wedges in place and proceed. Use your lug wrench to loosen the lug nuts about 1/2 turn. You want them loose enough to take off with your hands, but not completely removed. Place the jack under the pinch flange. This is one of the strongest parts of your car and perfect for this purpose. Consult your vehicle manual for proper jack locations. With your jack, lift the car until the flat is 6″ off the ground. Unscrew the lug nuts from the flat tire using your hand. Take of the tire and replace it with your spare. Put your lug nuts back on. Tighten them as much as you can using your hand. It is important not to use your wrench while the vehicle is elevated. Lower the vehicle back onto the ground. You may now fully tighten the lug nuts with your wrench. Next, stow away the flat tire, jack, wheel wedges, and all the other items you used. Spare tires are not meant to fully replace your tire. They are designed to be used in the case of a flat. You should take your car in to a tire technician to have the spare replaced with a proper tire. Come into Metro Nissan of Montclair for your service needs. Schedule an appointment over the phone or online at MetroNissanMontclair.com. Metro Nissan of Montclair, Doing it Right!